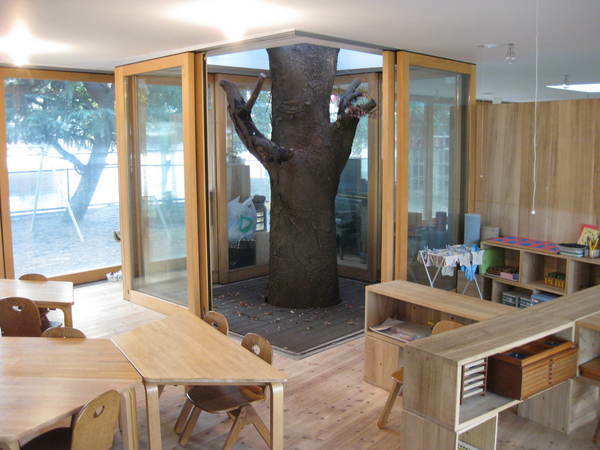 I recently saw a great TED talk by Takaharu Tezuka, describing his design of a kindergarten building in Tachikawa, Tokyo, Japan. The building is oval in design, with a massive roof that is used as an outdoor space in addition to the courtyard for running around, climbing in trees and occasionally to view special events and assemblies. Tezuka describes how the oval shape naturally encourages children to run around in circles throughout the day. In fact, they found the children run around 4,000 meters or roughly 2.5 miles a day! The large oval roof covers all of the classroom spaces, which can be opened up to the outdoors eight months out of the year. The children are given blocks and other tools to separate the classrooms areas, but the classrooms are also effectively open to each other. The school is a Montessori school, founded on the principles of Maria Montessori, a common teaching methodology used around the world. If you’ve ever seen a Montessori classroom in action, you would know that a big part of this educational style is giving children the skills and confidence to “do things themselves” and to manage their time. 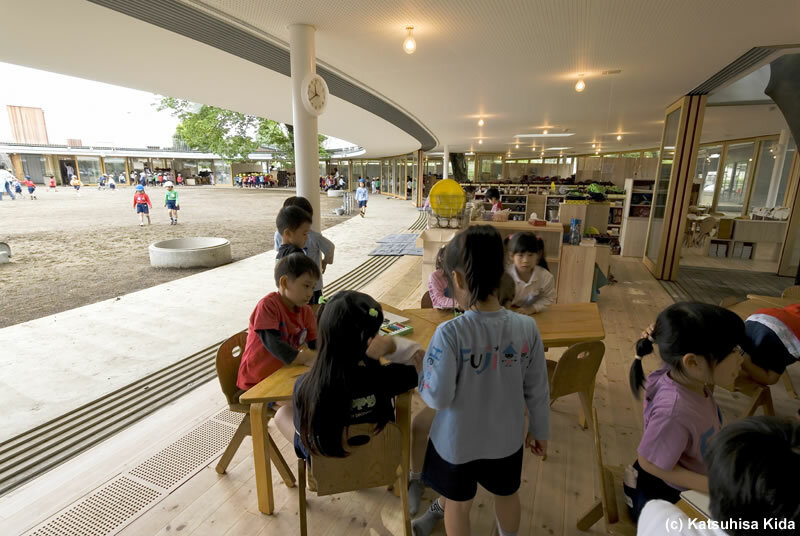 The Fuji school allows children to easily run around and get out their wiggles between “work” assignments and elements of the building are at a child’s scale throughout to allow the children to be in control of their environment. I happen to have a 4-year-old in a Montessori school right now and helped out in my daughter’s classroom just this past week. I can visualize see how the design of this particular building would allow children feel a sense of independence and freedom. The play area in the center of the building and on the roof are completely protected and safe, so running around is easy for teachers to manage and encouraged. I’m particularly impressed at the ways that the designers integrated nature – zelkova trees, sunlight and natural materials into the building. The sense of indoor and outdoor space is wonderfully blurred. Through a combination of the building’s design and the educational philosophy, it’s clear this school was created for movement throughout the day and with mental health in mind. So how can we take lessons from this building and apply them to hospitals, office spaces, city buildings, parks or other spaces in our cities? There is a growing amount of research on the subject. For more information try the Active Design Guidelines and the Building Healthy Places Toolkit, created by ULI and the Center for Active Design.